Teacher Resources > Monday Morning Ready > What do soldiers around the world eat? What do soldiers around the world eat? 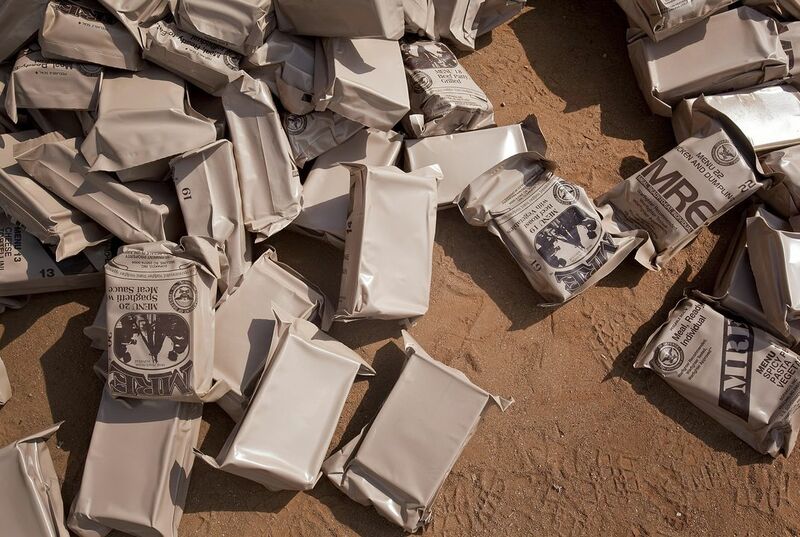 Would you volunteer to eat nothing but Army-issued MREs for a month? Why or why not? Why do you think the military is so interested in studying the gut health of its soldiers? Are you surprised that they haven't done this before? Why or why not? According to the article, Army researchers now serve pizza in MREs. Why do you think this has just been done? Why do you think some people call pizza the "holy grail of MREs?" According to the article, MREs have to meet a laundry list of requirements, such as surviving a 1,250-foot parachute drop and staying edible for up to 3 1/2 years in temperatures up to 80 degrees Fahrenheit. If it's so difficult to produce meals that meet these demands, why do you think most countries also try to offer soldiers food that resembles their homeland's cuisine? Inform students that this article presents a problem (developing healthy, tasty MREs) and a solution (conducting an investigation to test the gut health of volunteers who eat field rations for a month) faced by military personnel. While that problem may be unique to troops on patrol or on the battlefield, it is a major issue for those involved. Point out that military personnel in other situations—and the families that support them—encounter obstacles of their own. As a class, identify the branches of the U.S. armed services: Army, Navy, Air Force, Marines, Coast Guard and Guard and Reserve. Invite volunteers to share what they know about each. Have students conduct research to learn more about one or more branches of the armed services. As students investigate, challenge them to identify a problem encountered by military personnel or their families. Once students identify a specific problem, encourage them to brainstorm ideas for a solution. Give students time to write a brief essay outlining their ideas. Invite students to share their essays with the class. After all essays have been read, identify ideas that could be implemented in your local community. As a class, select a branch of the armed services and conduct research to learn more about it. Challenge students to identify a problem that affects military personnel in this branch or the families of those who serve. Then divide the class into small groups. Encourage each group to brainstorm ideas for a solution. Give them time to write about their ideas. Then have groups share and compare their solutions. Divide the class into small groups. Assign each group one branch of the armed services to investigate. Instruct them to identify a problem that affects military personnel in their assigned branch or the families of those who serve. Encourage them to brainstorm ideas for a solution. Give groups time to write about their ideas. Divide the class into small groups. Instruct groups to select two branches of the armed services to investigate. Challenge them to identify a common problem that affects military personnel in each branch or the families of those who serve. Encourage them to brainstorm ideas for a solution. Give groups time to write about their ideas. Assign each student a partner. Instruct pairs to select two branches of the armed services to investigate. Challenge them to identify one common problem that affects military personnel in each branch and another problem that affects the families of those who serve. Encourage them to brainstorm ideas for a solution to each problem. Give groups time to write about their ideas. Read this interview conducted by the National Museum of American History to learn why dogs have always been an important and valued addition to military units. Even the smallest, everyday things can lead to big improvements in people’s lives. Read this article from the National Museum of American History to learn about the intriguing history of Tabasco sauce in the U.S. military. Read this Smithsonian article to learn how Army scientists came up with a recipe for a long-lasting pie that can be stored at room temperature. This online exhibit, presented by the National Postal Museum in partnership with the Legacy Project, features letters written by military service members and their families, friends and loved ones, from the Civil War through the Vietnam War. It provides an irreplaceable perspective on war history and reveals the priorities of life through vivid, heartfelt words and sentiments. In this lesson plan, students explore the Cooper-Hewitt Smithsonian Design Museum’s exhibition Design for the other 90%. They examine the importance of design in creating positive change in the world. Then they write letters to share their thoughts with a larger community. This Smithsonian website integrates Flash video and text to examine armed conflicts involving the U.S. from the Revolutionary War to the war in Iraq. Each conflict contains a brief video clip, statistical information and a set of artifacts. Would you let a robot operate on you?